Let’s face it, some pets sure can get into trouble. Whether you have a potty training puppy, a curious cat, an energetic big dog, or any pet in between it can often be advantageous to control their movement for a little while and corral them in one place. Ideally you’d like to do this with a barrier or safety gate that fits your home style and lifestyle so as to not be a nuisance. That’s exactly what this site is designed for–to help you quickly find the best pet gate for your situation. That best gate varies for a lot of people. If you have a large pet you might need an extra tall pet gate. 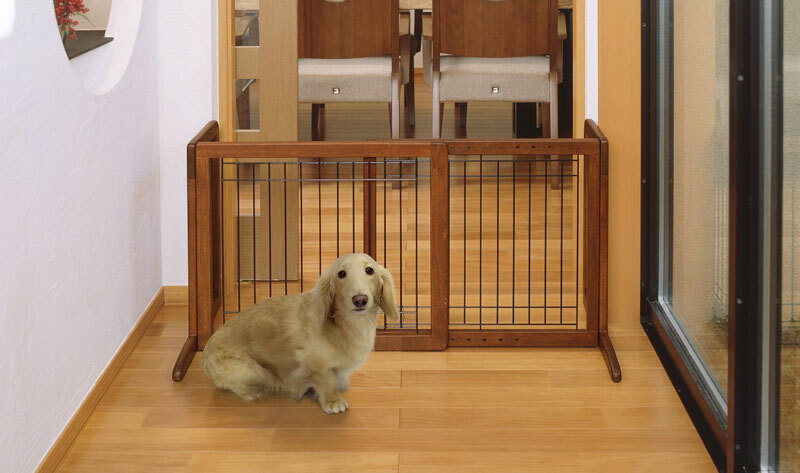 If your home is open concept or has a lot of wide doorways you’ll probably need an extra wide pet gate. If you don’t want to put holes in your wall for semi-permanent gate hardware, you may want to look into pressure mounted pet gates. If your walls are susceptible to damage from pressure gates, well first try a pet gate wall saver, but then if you don’t mind some extra storage space you may want to look into a freestanding pet gate. 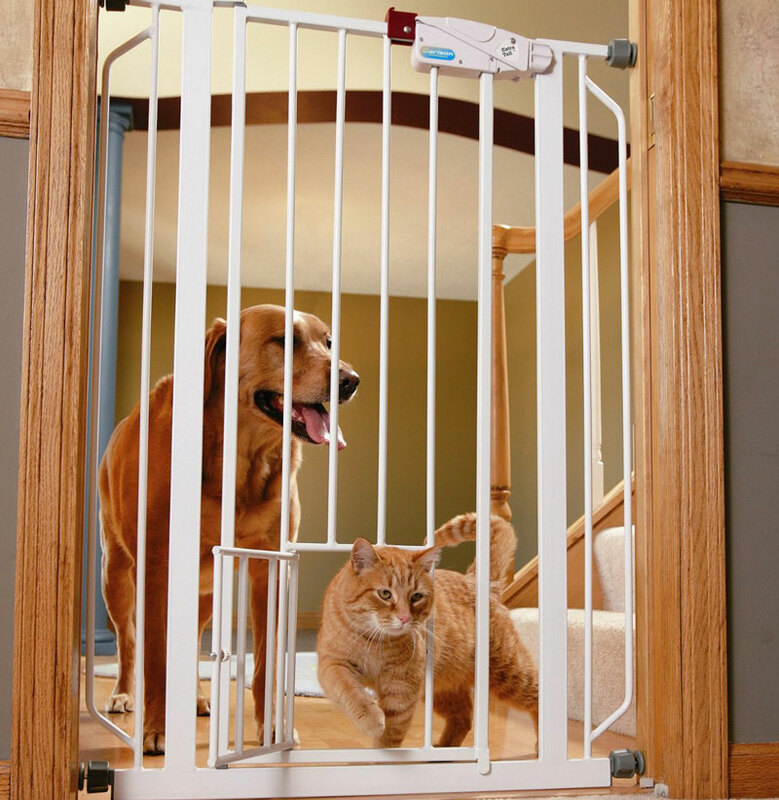 If you have a modern home you may like the aesthetic of retractable pet gates. If you have a traditional home decor, perhaps wooden pet gates would be more your style. As you can see, there’s a lot of choices. We’d like to help you narrow it down. You can hone in on a choice by going to any one of those sections mentioned where you’ll find detailed information on that style of pet gate. Or, simply browse the comparison table we’ve assembled below of some of the best standout pet gates of 2019 in all styles. Hopefully the comparison chart above is helpful in providing you some quick statistics on the best pet gates. The first step to identifying the right gate for you is of course to consider the needs of your pet, the area(s) in your home where you would like a gate, and lastly which style of gate suits your taste and lifestyle. Let’s take a look at some of the different styles of pet gates and examine what situations they work best for. Extra wide pet gates can be very versatile. Often they will have hinges that let you angle the segments of the gate to increase or decrease the overall width so it perfectly fits into your space. 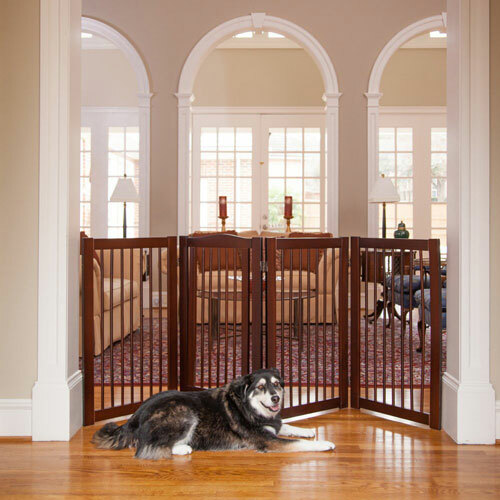 If you have an open concept floor plan or large doorways, you will want to look into extra wide pet gates. Standard doorways are 34 inches. 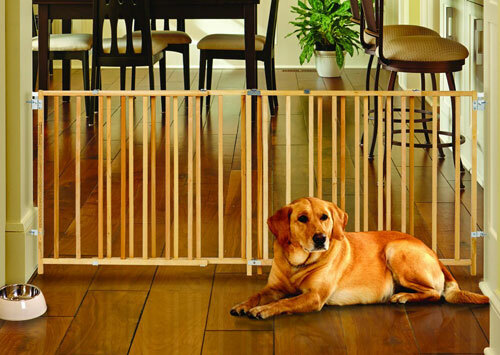 Extra wide pet gates start at 50 inches, many fit openings up to around 72 inches, and some of the longest go way up to 192 inches. The widest pet gates can even circle up and form a playpen area to contain your pet without the benefit of a wall, like the Regalo Super Wide Gate and Play Yard. For more options that cover large spaces, read our full guide about Extra Wide Pet Gates. Pets can be crafty. Some dogs can jump clear over normal sized barriers, cats can figure there way over most anything. For pet owners with these types of high jumping or large pets, choosing an extra tall pet gate over a standard height could be very important. Most standard pet gates have a height around 26 inches to 32 inches, and some small pet gates can be as low as 20 inches. For more options with additional height, read our full guide on Extra Tall Pet Gates. Another way to achieve extra wide barriers is by using a freestanding pet gate. 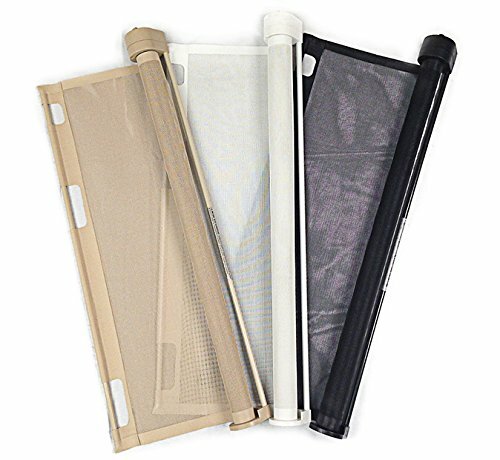 Often they are expandable or accordion style, and some models can stretch to be up to 72 inches wide. The big advantage with freestanding pet gates is that they don’t require a wall and are easily moved around to wherever you need it in a jiffy. You can use them to barricade doors, and with some cleverly designed freestanding gates you can even prop them against a wall to make a small contained playpen. To view some of the best individual models, read our full page on Freestanding Pet Gates. Retractable gates have become increasingly popular in modern homes, or any home where the owner likes a minimal approach to a safety barrier. Many models look very elegant and are made of a mesh fabric. The disadvantage for retractable baby gates is that if your pet is small, they can sometimes wiggle under the mesh if it is not completely taught and has some space at the bottom. Mesh fabric can also be more susceptible to wear and tear from larger pets than other material like solid metal. But if you like the aesthetic of the hideaway design, have the right kind of pet for it, and don’t mind the higher price tag, a retractable pet gate may be for you. To see more details about individual models, read our full guide to Retractable Pet Gates. 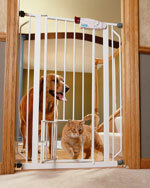 With pet safety gates its not always about barricades in the house. 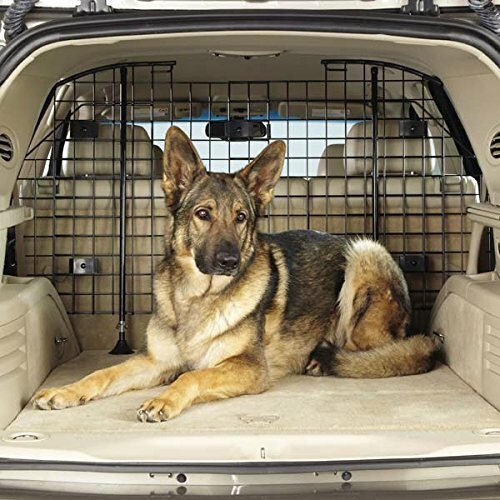 Barriers in the car can be very important to control your pets mobility and keep everyone safe and happy without the use of a kennel or cage. There are several different types of car barriers. Most are metal, pressure mounted and designed for the trunk–and there are various metal designs–while some are deluxe mesh barriers and designed for the back seat. 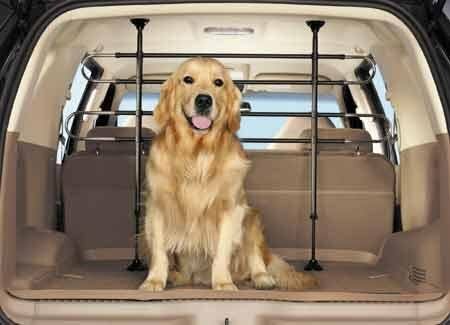 Take a look at some of the best options in more detail on our guide to Car Pet Gates. Unfortunately many plastic and metal pet gates can lack style and elegance. The last thing you want is a fixture that clashes with your home’s aesthetic. Choosing a wooden pet gate can afford you a more traditional, warm vibe while still providing an effective barrier for furry family members. Most wooden pet gates are freestanding models, though there are also a handful of good hardware mounted options as well. Take a look at some of the best options in more detail on our guide to Wooden Pet Gates. Not all pet gates are suitable for use on stairs. In fact, most are not at all suitable for use at the top of stairs, which is often the most dangerous place in the home. Gates for use on stairs should be hardware mounted for extra stability. 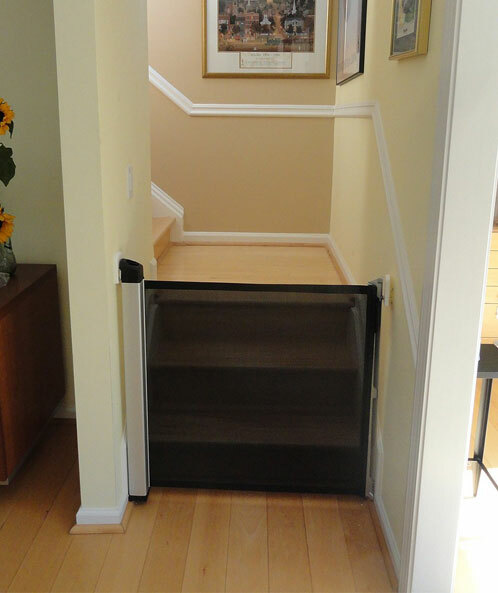 If possible, look for gates certified safe for use on stairs by a third party. The Juvenile Products Manufacturers Association (JPMA), for example, is a non-profit that certifies gates safe for use on stairs. 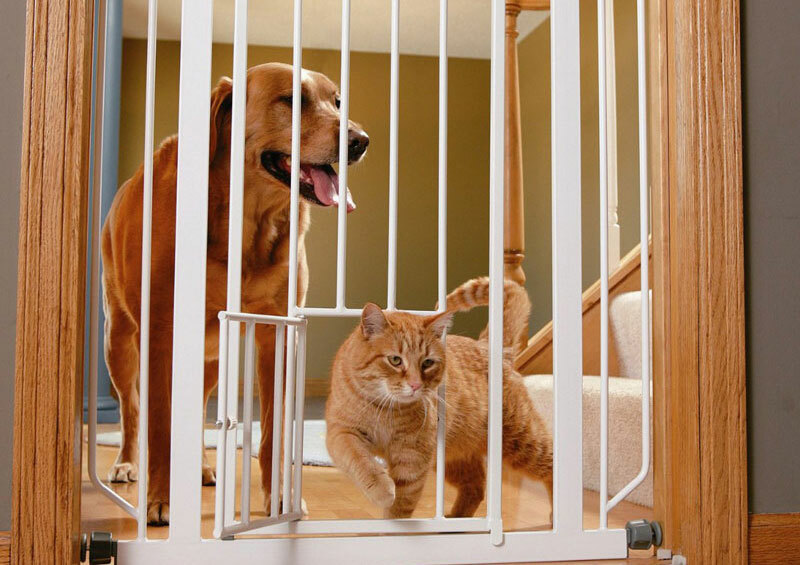 Take a look at some of the best options in more detail on our guide to Pet Gates For Stairs.